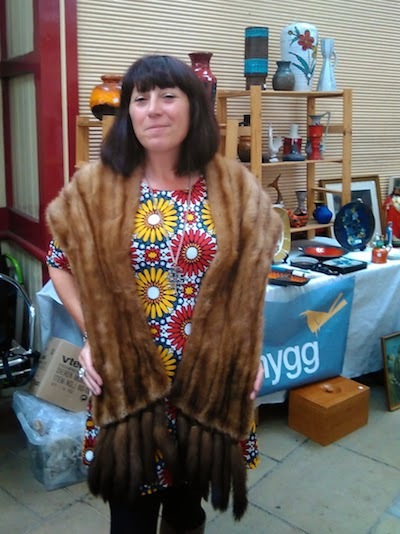 Now Alison from Snygg has commented that I went under the radar on Sunday, refusing to divulge my secret identity, but how else was I going to get her to model this pristine mink stole from Bus Stop Vintage? It’s from the 1940s and was £120.00 but it had that beautiful tailoring to the shoulders which meant that you’d only lose it if you wanted to! I know it isn’t an obvious match for the dress, but I feel she wears it well (to paraphrase Rod). Marie, Bus Stop’s curator, says “I’m a bit of a hoarder” and she can’t quite remember where it came from! Not being able to resist the odd food thing, at Make Do and Mend’s stall I happened upon a beautifully pristine 1950s Grimwade’s “Quick Cooker” pudding bowl. 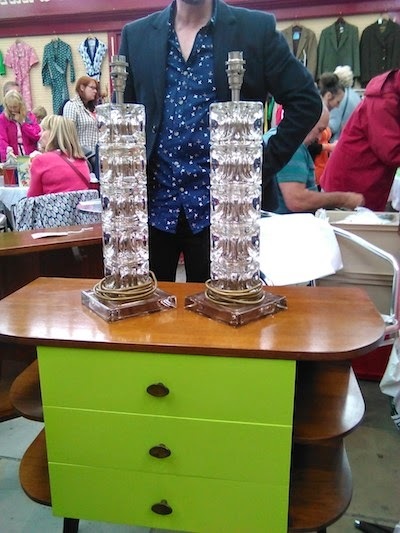 Now these things can go for up to £120.00 (and the V&A have one in their collection) but here at The Vintage Village it was only £22.00! 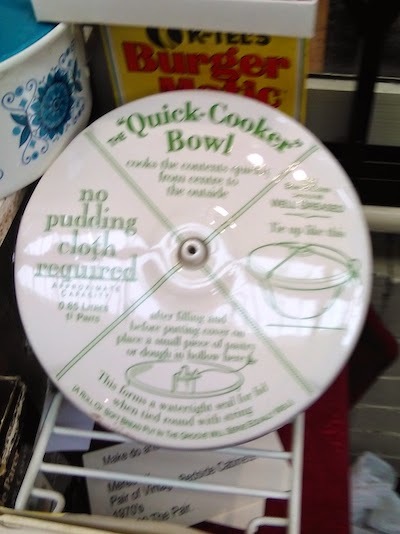 Traditional Christmas puddings would have had this bowl in much in demand, particularly as it claims to “cook the contents quickly from centre to circumference” with “no pudding cloth required”. This gadget won a gold medal in London in 1911. Who says I know nothing useful?! 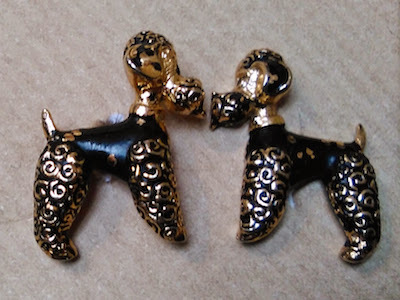 Toddling along the side, I came across a pair of poodle cufflinks at Enid Brown & Sons. Now I admit, my partner Andrew Ayres - a regular photographic contributor to the Vintage Village Facebook page - has a thing for small dogs, but I liked the fact that they had been inherited from a family member and were a perfect item for the impromptu gift store (kept for when the people you love seriously pull out the stops and deserve something, but you don’t have time to find that something before the thank-you moment is lost) being only £8.00. It is impossible not to notice the displays by Planet Vintage Girl. 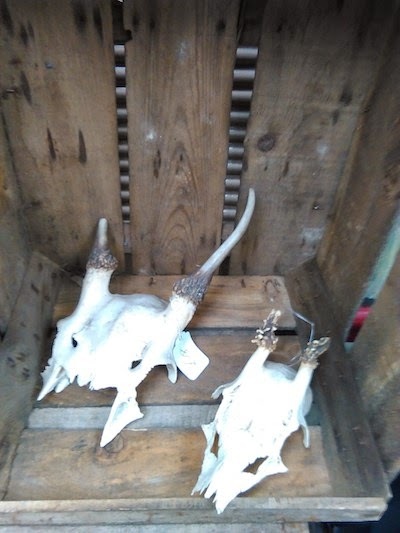 They said that these roe deer skulls were originally intended to be used as Christmas ornaments. This seemed a little too True Detective for me, but I couldn’t deny the attraction of the fragile bones and the haunting contrast of their colour. Roe deer are the smallest indigenous deer in Europe apparently and they have more of these at their shop in Manchester. Here is where my resolve became unstuck and I was saved by the fact that a table I fell for on this stall had been sold before I got there, otherwise I’d have been still trying to find a home for it now. Whittaker & Gray had a beautiful 1950s three drawer side table with teak veneer that they picked up at an auction in Chester and it was only £68.00. I’ve crowned it with a pair of lovely Sciolari-style ice cube table lamps. Gaetano Sciolari pieces are understandably popular amongst the cognoscenti, with prices in four figures, and this pair of lamps was a steal at £245.00. 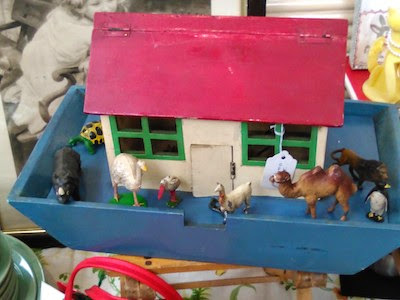 I am sad that my daughter isn’t a couple of years younger otherwise I’d have had an excuse - as opposed to a yearning - for this 1950s handmade Noah’s Ark housing a selection of Britain’s toy animals. The ark has a matching carousel and was bought from the daughter of the maker, who got the design from Hobbycraft Magazine. I think £48.00 was bargain for this type of workmanship. 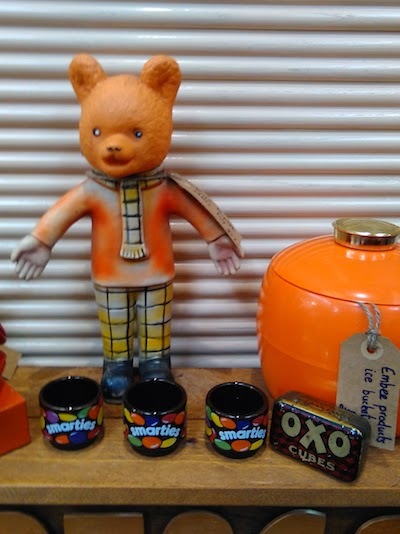 My love of orange lead me to this rare 1960s Rupert toy with this lovely Embee Products ice bucket. Embee’s manufacturing name was Mendle Bros. and the entwined M and B in their logo relates to the initials of the Welsh manufacturers. Mendle Bros. exhibited in 1947 at the British Industries Fair, when their advert stated that they were "Manufacturers of Plastic Fancy Good, Tableware, Salad Servers"! When I get tired of collecting condiment sets, I think Embee might be my new thing! Rupert the Bear was born in 1920 and there has been a Rupert Annual published every year since 1936. I always associate him with my late grandmother as she was a Daily Express reader, so even though I wouldn’t describe myself as a fan - and certainly not one of those true Followers of Rupert - seeing him always gives me a warm feeling, which was fortunate given the weather outside. Fortunately for traders and shoppers, it got better later but as I left for the day to head to work, my attention was caught by this lovely juxtaposition – a truly British combination! Without the help and support of our very special Finder of the Fair this month, Esther Morrison, The Vintage Village might never have existed! In her capacity as a council bod charged with developing culture and leisure in our borough, she threw her weight behind our hare-brained scheme to use Stockport market hall on a Sunday for a vintage fair, and the rest is history. I'll let her take over here . . . Many, many moons ago, when the ‘vintage strategy’ for Stockport’s Market Place was not even a flow chart on a beer mat, Paul Downs, the under-appreciated manager of Stockport Market, and I met Sarah and Alan, co-organisers of what became The Vintage Village. That was 2010 and, as we approach the awesome Vintage Village’s fourth birthday, Sarah has decided to ‘reward’ me by anointing @FoodFanStockpt (aka me) as Finder of The Fair. In true Esther fashion, I’m late with me feedback. I’d like to have a great excuse, like I was saving blind penguins in the Antarctic, but actually I was trying to train volunteers for my new community shop, café and gallery - Earlams - in Styal while preparing for a vacation in Green Spain. My volunteers are happy (I think they may be joyful optimists by disposition) but I ain’t ready! However, having been hounded over Twitter to get my act together and strengthened by a couple of large Tanquerays, I’m ready to share. Originally, I was thinking of following my natural spend instinct and picking things that were food related. My large collection of condiment sets, the periodic changing of my crockery when I fall for a new set at the Vintage Village and my difficulty in resisting vintage picnic hampers (although the Hay Festival is the only time I have time to cook for a proper picnic) are all fuelled by visits to Vintage Village. Mind you, so are some of the acts that perform at the monthly Foodie Fridays I co-ordinate, so I suppose it isn’t all bad? 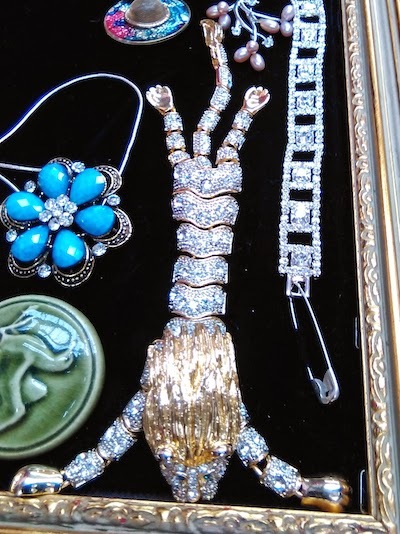 So, I decided to look for the weird and quirky items that say more about the wonderful traders that flock to the event than my personal spending habits. If I hadn’t, there’d be far too many pictures of 1960s kitchen implements to inspire anybody! 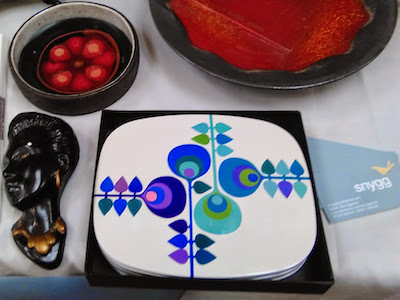 I scooted past Snygg as I have I fought off a number of interested parties to get my big table lamp, but I confess I was taken with these Worcester Ware table mats because of the colour scheme, though they were too small for my dinner plates! 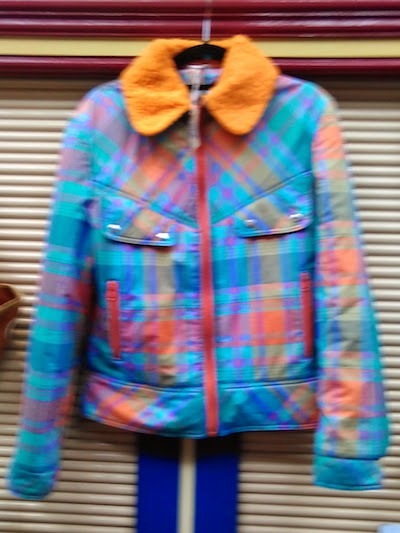 I came across this 1970s anorak because I love orange. It had the label Pal-O-Mino and they’d found it at a car boot sale in Staffordshire. Pal-O-Mino was one of the brands manufactured by C&A back in the day and the Stockport store has happy memories from my teens. Clockhouse, another C&A brand, was the height of cool back in the day! 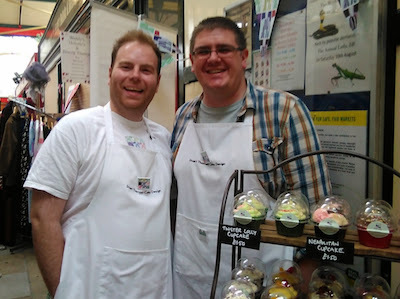 My next find was Stuart and Alistair of Stuart Thornley Cake Design. Now any Vintage Village aficionado knows these two. They were voted The Vintage Village Favourite Trader by visitors last year, and have traded at every Vintage Village since 2010. Stuart is the shy one (!) but Alistair appeared on Come Dine With Me some time back and still pops up on repeats! I found them where they usually are, so maybe that’s cheating? I happened upon a pair of rather intimidatory ceramic elves on this stall (not pictured) but also an extraordinary shoulder brooch that belonged to her mother-in-law. I can only assume that her M-i-L relationship was healthier than mine. I love the idea of having a big cat balancing on your scapula. My next stop was Garbo Antiques. She’s ‘acquired’ a couple of jaw-dropping headdresses that had been designed for the Altrincham Garrick’s production of Aida (see them here). The Garrick was founded in 1914 and hosts 12 productions a year. 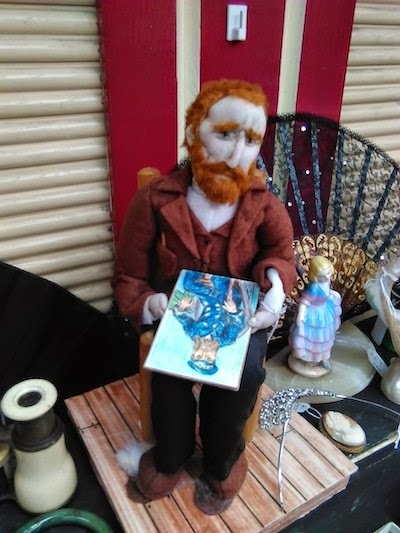 There are a lot of costume items on this stall, and various decorative curiosities including a handmade felt doll of Vincent van Gogh. There was such lovely detail on this doll and the stitching was exquisite. Now this next find, was a real Find. 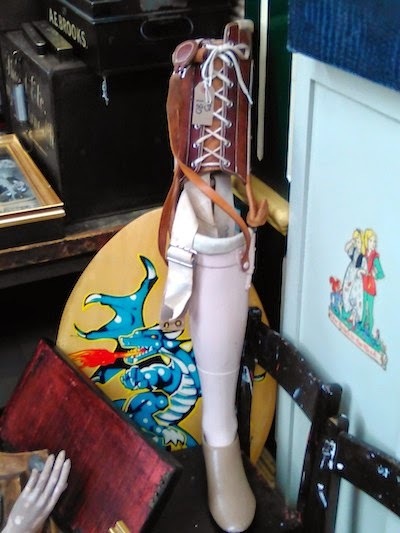 Shabby Cheek also had glass eyes and false teeth, but it was the false man’s left leg that caught my attention! It’s from the 1950s, with a beautifully stitched leather top. It was a very slim leg – almost Regency in its manner – so nothing like mine. But it was a crafts piece and a real one of a kind. Mind you, I don’t know who you could buy it for? It might make an umbrella stand though, which was appropriate for the weather. Editor back again: huuuge thanks Esther for your unpredictable and sometimes surprising selections. You certainly fulfilled the brief of showcasing the variety of vintage goods available at The Vintage Village!